Brother MFC-J5330DW Review – This is a great multi-function inkjet printer, which is what you could have bought it for the day we tested it. At the time of going to press. This happens a lot with printers, and it makes it very difficult to pass judgement on them. The MFC-J5330DW is only a tenner more than the HP Officejet Pro 6960 and adds the ability to print A3 pages, which can come in very handy. You’d have to consider whether it’s worth it. The relatively bulky sideways-on print engine makes this feel and look more like a laser printer, and its print speeds – up to 16.7 pages per minute (ppm) in our tests – are beyond most inkjets. The practical 250-sheet A4 paper tray pulls out to take A3 (you’re not limited to one sheet at a time), and the scanner has a 50-sheet automatic document feeder (ADF). You can print both sides of the paper (duplex), although photocopying is one-sided only. A full set of inputs includes Wi-Fi and Ethernet as well as USB and SD card. The quality of prints isn’t amazing, but very acceptable all round, with bright colors and decent photo reproduction. One explanation for the volatility of printer pricing is that manufacturers make most of their money from ink, so they can afford to manipulate the printer price to maximize sales. Using Brother’s XL cartridges, running costs work out at about 4.2p for a color page and only a penny for black only. That’s incredibly cheap, and, bearing in mind pages full of photos or graphics will use a lot more ink, the savings will soon add up to more than 30 or 40 quid. On that basis, we’d recommend the MFC-J5330DW – but do shop around and pay as little for it as you can. 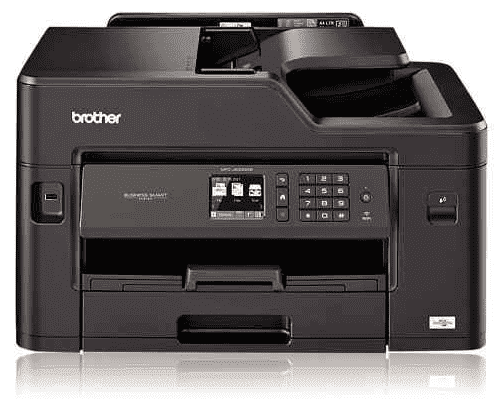 It should be added that the Brother MFC-J5 and J6 series printers are rugged. We have had these type of printers in office cabins on dusty building sites for years and they just keep on working. Another good feature where the MFC-J series printers beat the HP OfficeJet printers hands down is that the Brother printers can easily be installed on a Windows server and shared across the network. The Brother printers can also send scans to shared folders on a Windows server using domain level authentication. By comparison we have had an absolute nightmare with HP OfficeJet printers in a domain network environment.